Does Flint Still Not Have Clean Water? - Truth or Fiction? A July 2017 Facebook status update about poor water quality in Flint, Michigan continues to circulate. 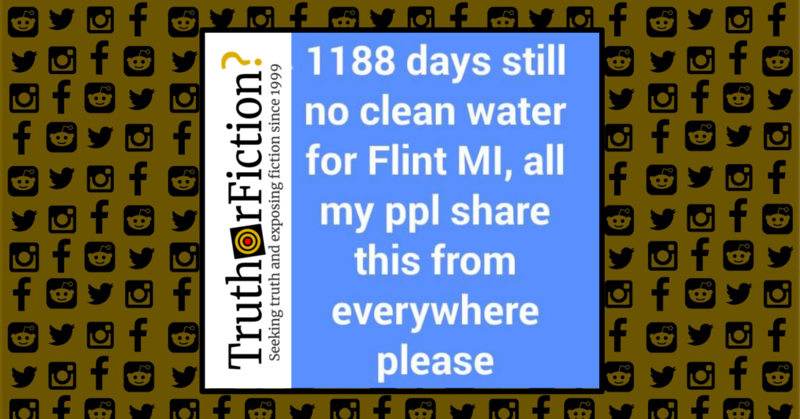 Flint, Michigan still does not have clean water. On April 25, 2014 officials from Flint, Michigan switched the city’s water supply to the Flint River as a cost-cutting measure for the struggling city. In doing so, they unwittingly introduced lead-poisoned water into homes, in what would become a massive public-health crisis. The problem started when officials decided to switch the water supply from the Detroit Water and Sewerage Department to the Karegnondi Water Authority to save money for the economically struggling city. Before that connection could be built, the city turned to the Flint River as a temporary water source. By May , residents were complaining that the brown water flowing into their homes looked and smelled weird, but the largely majority-African American and poor citizens went ignored by officials. In August , E.coli and coliform bacteria were detected in Flint’s water. The defining event of the Flint crisis was a switch in area’s water supply on that date. A lack of corrosion inhibitors in water deemed more acidic than the original supply was (in part) believed to have contributed to degradation of older lead pipes, caused levels of it to leach into tap water. After Michigan’s governor announced the state will stop providing free bottled water to residents of Flint — afflicted four years ago by lead-tainted drinking water — churches and charities said [in April 2014] they’re bracing for a surge in people seeking help…. The state’s decision to close the four remaining bottled water stations comes as Gov. Rick Snyder said [in April 2014] that strides have been made to reverse the high levels of lead that were found in the water supply. But even that minimizes the real problem affecting Flint and its water supply. Because of the Flint water crisis, it’s now generally acknowledged that the federal lead limit is dangerously outdated. Lead is especially harmful to pregnant women, infants, and young children. Even at very low levels, lead can cause kids to lose IQ points and to develop learning disabilities and behavioral problems. Flint has identified about 18,300 lead or galvanized steel water lines and has replaced nearly 7,000 of them, city officials announced [in December 2018]. The city hopes to complete replacement of all service lines that could contribute to lead contamination of the city’s water by the end of 2019, Mayor Karen Weaver announced at a press conference in Flint [in December 2018]. The Detroit News erroneously reported [in December 2018] that Flint officials planned to announce the completion of lead service line replacement at the press conference. In fact, they announced the completion of excavations that identify the type of service lines that carries water from the water system to individual homes. State environmental regulators acknowledge there’s more work to be done. “While the DEQ recognizes all of the local and state efforts toward replacement of service lines within the community, more work on lead and galvanized steel service line replacements will continue throughout 2019 with a goal of ensuring lead in the drinking water continues to be maintained under the federal action level,” Scott Dean, communication director at the Michigan Department of Environmental Quality. Flint Mayor Karen Weaver made comments [on December 4 2018] about the status of the effort to rid the city of lead service lines which highlighted the number of excavations the city has overseen, rather than the number of actual lead lines replaced. The City is operating under a settlement that requires it to target excavations at homes most likely to have hazardous lead and steel pipes, but more than 80% of the City’s excavations this year were of homes with copper pipes. To date, the City has replaced only 7,700 lead and steel service lines, leaving University of Michigan experts to conclude that thousands of hazardous pipes likely remain in the ground. “It’s the number of lead pipes removed that matters, not the number of holes dug. The City needs to finish the job of finding and replacing the lead pipes in Flint, as our agreement demands that they do,” says Pastor Allen C. Overton of Concerned Pastors for Social Action, a plaintiff in [a] case [against officials]. There are roughly about 2,500 lead service lines left to replace in Flint. The homes are included in the first group of Flint addresses to be checked by contractors based on their chances of having lead or steel pipes. All the remaining homes in Flint will have their pipes dug up and checked this year, so more lead or steel service lines could be discovered. But the majority of lead pipes are expected to be in the first digs. Mayor Karen Weaver is determined to remove all the lead from Flint, Allen Overton of the Concerned Pastors for Social Change, a plaintiff in the settlement, said. The meme stated that as of July 2017, Flint, Michigan still did not have clean water. In April 2018, former Michigan Gov. Rick Snyder declared the crisis over, but residents and their advocates strongly disputed that claim. As of April 2019, more residents in Flint had clean water, but not all of them. Most projections for the completion of necessary work to ensure clean water for Flint residents were not until sometime in 2020. Flint Department of Public Works Director Rob Bincsik said the funding is part of the $100 million promised to the city from the federal government years ago. The funding was passed through the DEQ’s Drinking Water Revolving Fund, which is forwarding it to Flint. — Completion of a pipeline hooking up to a secondary water source. — Improvements to the Dort and Cedar Street Reservoir and Pump Station. — Construction of a new chemical feed building. — Replacement of the Northwest Transmission Main. — Various water main replacement work. — Water quality monitoring panels.